Cat peeing outside the litter box? Follow litter box "golden rules"
Why do cats pee outside the litter box? All cats, male or female, neutered or not, will mark out their territory with urine spraying. Normally this is rare and discrete. But when this natural behavior happens in your house, it can be very frustrating. When this happens, it is due to fear and anxiety. It can also be caused by a medical issue. If your cat starts peeing outside the litter box, please consult your veterinarian. Especially older cats, who are at risk of more medical issues. Using FELIWAY CLASSIC is clinically proven to stop urine spraying indoors. It will help your cat feel calm and comfortable and may help reduce urine. 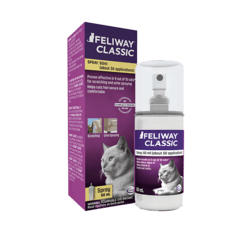 Using FELIWAY CLASSIC Diffuser continuously may help stop and prevent spraying, especially if your cat seems emotional and sensitive to any change at home.